NAGOYA - Hakuho beat fellow Mongolian yokozuna Asashoryu in an epic finale to clinch his 11th Emperor’s Cup win on the last day of the Nagoya Grand Sumo Tournament on Sunday. 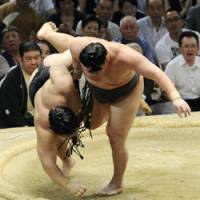 Hakuho was made to work all the way by Asashoryu (10-5) in an enthralling encounter at Aichi Prefectural Gymnasium, but the Miyagino stable star prevailed with a stylish underarm throw at the ring’s edge to capture the title with a 14-1 record. Bulgarian ozeki Kotooshu had briefly given himself hope of forcing a playoff after easily barging out ozeki Harumafuji (9-6) in the preceding bout, but had to be content with a runnerup finish and a 13-2 record. “Unfortunately I couldn’t win the last tournament but I practiced well before this meet and Nagoya is just once a year so I’m happy to win,” said Hakuho, who lost to Harumafuji in a playoff at the summer meet in May. “I want to just take each task as it comes now and hopefully I can become a yokozuna like (former great) Futabayama,” he said. In other bouts in the top ranks, Kotomitsuki (12-3) gave home fans plenty to cheer about as he broke out of a stalemate and sent out ozeki rival Kaio (8-7) from behind, while ozeki Chiyotaikai eked out a winning record with a textbook slap-and-pull victory against Mongolian sekiwake Kakuryu (5-10). 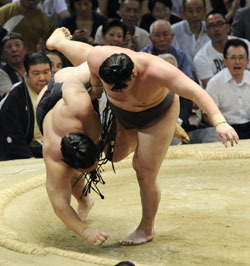 Fifth-ranked maegashira Aminishiki (11-4) was awarded the Technique Prize, one of three awards given by the Japan Sumo Association to wrestlers on the final day of a tournament, but ended the meet on a losing note after being tossed to the dirt by sekiwake Kisenosato (9-6). Shotenro wrapped up an excellent showing by yanking down Georgian grappler Kokkai (5-10) to finish on 11-4. The 10th-ranked maegashira was rewarded with the Fighting Spirit Prize. No Outstanding Performance Prize was awarded for the fourth tournament in a row. Estonian tower block Baruto deployed a trademark “tsuridashi” technique to lift out komusubi Kotoshogiku to also close with an 11-4 mark.